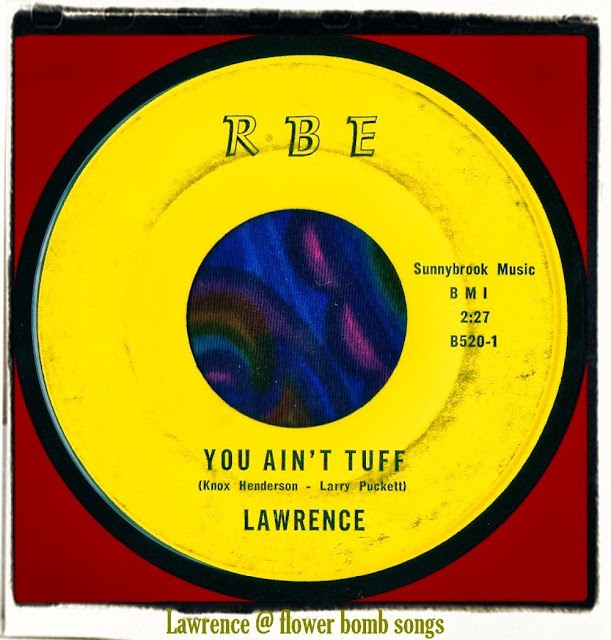 LAWRENCE - 'You Ain't Tuff'/'Taste Of Honey' (RBE B520) 196? I know of three version of the garage punker 'You Ain't Tuff', the original recording was by The Uniques and another gritty and equally hip remake was by Lindy Blasky & the Lavells. The other and much more obscure 'You Ain't Tuff' was recorded by Lawrence. Which begs the question, who was Lawrence? According to 'Teenbeat Mayhem' the recording is from somewhere in Texas but apart from that no other information is provided, not even the year of release which I suspect to be sometime during 1966. Lawrence delivers a decent version but it's not in the same league as the one's we all know. It's still a good effort though and has some memorable rasping harmonica but the vocal delivery isn't tuff enough. The flip is also good, a cover of 'Taste Of Honey' recorded by many 60s outfits including The Beatles and The Hollies. The song dates from the late 50s and was originally an instrumental piece used in a British play that eventually made it to Broadway. It was then used in a 1961 film of the same title.